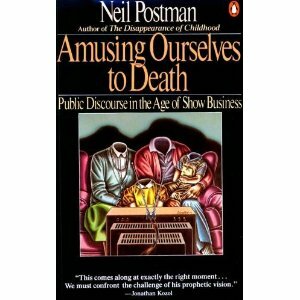 Several years ago I skim-read a book by Neil Postman provocatively entitled Amusing Ourselves to Death. It described the influence of television culture on public discourse, showing how it shortened attention spans and created a popular demand to be incessantly entertained. 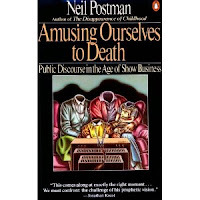 Now, with both thumbs firmly engaged in the Internet age, it strikes me that this book's thesis and particularly its title are prophetic. Think of it: Postman wrote before the advent of reality TV, which has blurred the line between entertainment and the entertained. We now watch "people just like us" on TV, subjected to all sorts of humiliating situations. "American Idol" certainly leads the charge--and MTV's "Jersey Shore" plumbs the depths--of such reputed entertainment. I've also noticed that reality TV has extended many people's 15 minutes of fame. Now, questionable "entertainers" like Snooky (what a name!) become household names, while persons with limited or no talent at all (Paris Hilton comes to mind) become pop icons. But think of this, too: Postman also wrote before the advent of the Internet, texting, and smart phones with multiple apps. We now have the capability of plugging into entertainment (if it can be called that) 24/7. Our noses buried in screens, we grow addicted to pixellated stimulation and many of us find ourselves rushing to check scores, emails, tweets, Facebook live feed, news and much else whenever we feel a hint of boredom or the need to unwind. And whatever other discretionary time we have is whiled away with such gripping games as "Angry Birds". My fear, and the fear voiced by an increasing chorus of the concerned, is that we're now raising a generation of people who will never know the joy of a good book by a fireplace...or a quiet walk in the woods...or the focused discipline of writing an actual letter...or the joy of getting a thoughtful letter from a loved one...or even the sustained sharpening of a spirited debate with a friend. Thanks to our ubiquitous technology our information base grows wider by the second...but are we becoming shallower at the same rate? I wonder and I worry, to be honest. Especially as I share in the raising of my two sons. I like my iPhone as much as the next person. But I've also enjoyed re-reading a series of novels lately. It's wonderfully relaxing to find my mind engaged and entertained at the same time--in a way that digital technology has yet to do. I'd be interested in your thoughts? Am I terribly old-school? I don't know about you, but I tend to learn through my mistakes, especially with technology. I drained the battery to my computer head unit for my power meter by leaving it too long in the download cradle. Dead battery. Needed replacement. Check. But what I didn't realize is that every time you replace a battery and freshly pair the head unit with the rear hub power transmitter, you must "zero the torque." How did I know that I needed to do this? Well, one clue was that on a recent ride I was still getting a power readout...while I was coasting downhill. Bad sign! What was worse, however, was what this meant. It meant that my studly ride earlier that week, the one where I broke all my former records of power output, the one where I was thumping my chest and elaborating on my middleaged fitness to my adoring wife...was suspect. Skewed. Exaggerated. That's tough to take as a middle-aged cyclist. All my numbers were inflated. My performance was not nearly as tremendous as I thought. Probably pretty commonplace. I had to zero the torque. It's a simple task, really. I found instructions online and it's recommended that this zeroing occur weekly. 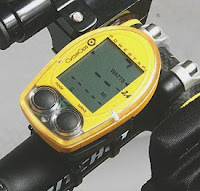 It insures that your power meter gives an accurate reading--and that you're given no freebie watts (which inflate your ego, to say the least). Today, I noticed to my great humility that my numbers were significantly lower. Not nearly as studly as I had imagined them to be. Sigh. "Zeroing the torque"--it recalibrates us to reality and gives us honest feedback based on a higher, objective standard. It occurs to me that this is what happens when we relate to the God of the Bible. For measured against ourselves or even our peers, we may feel that we're doing quite well morally and ethically (thank you very much!). However, this is not the ultimate standard we're given to use in measuring ourselves. The gold standard is God's: perfection, holiness, complete selfless love. This was God's original design for the people God made. How short we've fallen! God, it turns out, requires of us the fulfillment of this original standard, which, left to ourselves is impossible. God, however, offers the perfect fulfillment of these requirements in the obedience of his Son, whose sinless life, sacrificial death, and glorious resurrection allow all who will trust in him to measure up--and, so to speak, hit the numbers. I guess as humbling as it is, I'd rather measure myself against reality than delude myself in thinking I'm fitter--or even more moral--than I really am. Ultimately, I have this confidence because I live in a reality governed by a good and gracious, albeit holy, God. "Zero the torque"--it's the way to relate to reality...and to become more healthy in the process.